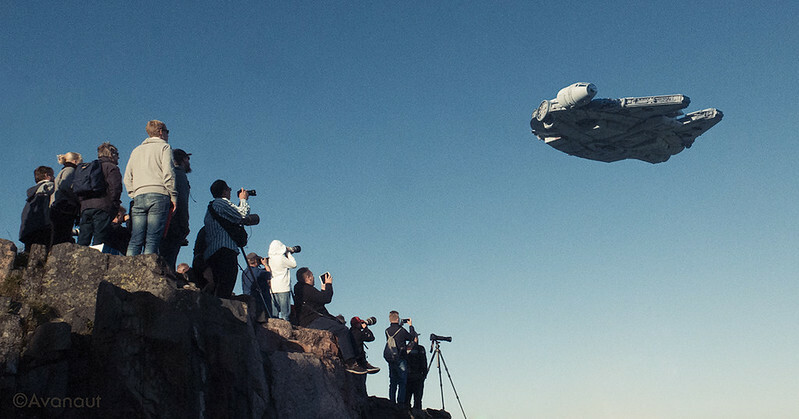 We always appreciate clever photography, but we love it even more when it involves Star Wars and Finland. 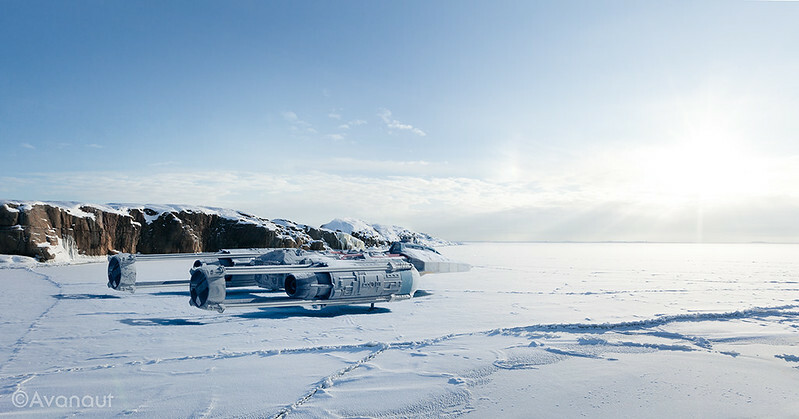 The work of Helsinki-based illustrator and photographer Vesa Lehtimäki does just that, bringing the world of Star Wars to life right in the heart of Helsinki. 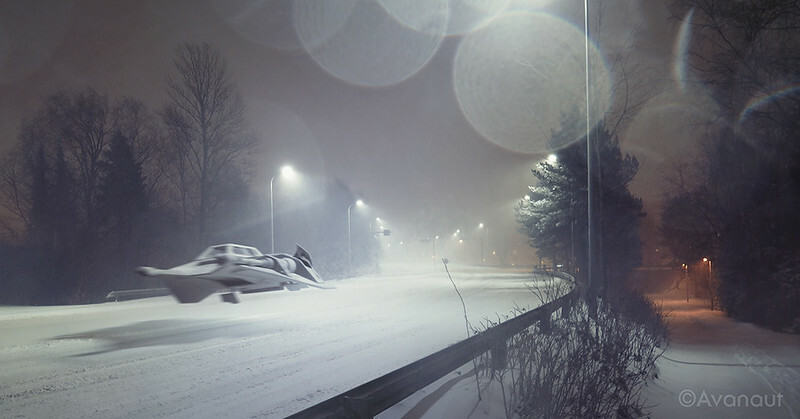 Using Star Wars scale models and forced perspective, Vesa (or Avanaut as he’s known online) creates stunningly creative photos that merge fantasy and reality. It’s no wonder he’s a 2017 Hugo Award finalist! 1. What inspired the Scale Model Project? Depending on how you look at the project, it’s either about eight years old or almost forty years old. I photographed my first scale model toy photographs around 1980. They were about my Battlestar Galactica models because I did not have Star Wars scale models. They weren’t available in Finland at the time. I also tried some WW2 airplane shots but the models I had were too small (1/72nd scale) and the camera we had didn’t focus close enough to make much of it. Also, I melted the propellers of my hero airplane model with pyrotechnics at first, and [subsequently] quit in frustration. I probably still have the model though. I returned to the subject a couple of times later, but with a different approach. I built my own scratch built spaceships but never quite finished them, and nothing came of it. 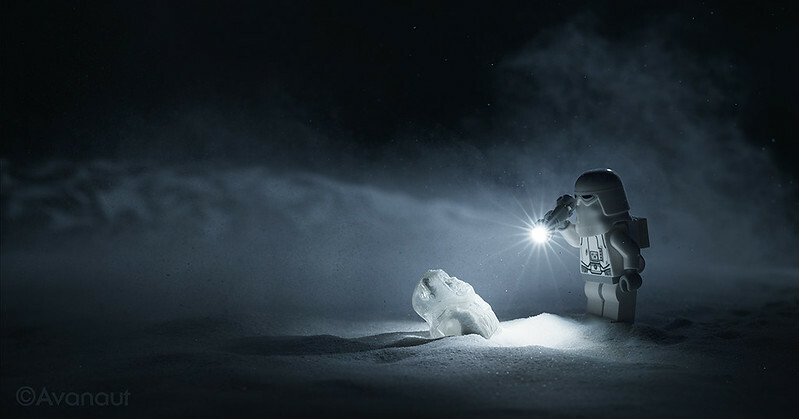 In 2009 as my newly found toy photography inspiration kicked in, I decided to give this another go. With modern day computers, Photoshop and digital cameras I finally had the tools I wished I had had decades ago. So, I dug in and poured my lifelong love of movie special effects on the scale models. I wanted to study film-making as a young man but ended up studying graphic design. Photographing the models is a way to explore a very narrow slice of my unfulfilled career dreams, but filtered through my design experience. To put it simply: I just love those machines. First, I build everything you see in my scale model photos. They are plastic injection kits and super rare exquisite resin kits. 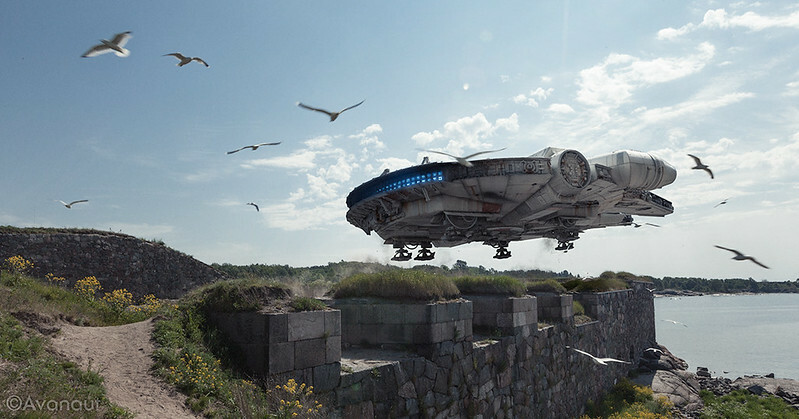 The resin kits, like the X-wing, are extremely accurate replications of the original 1977 filming models. The surviving originals were researched and reverse engineered part by part and created anew by a small group of gifted enthusiasts. The kits are then hand made and very difficult to come by. I build the models and fit them with fiber optics and led lighting. There are also scratch built parts added to make them even more accurate. For example, I have built the landing gear struts on the X-wing from brass and styrene. The ones that came with the kit didn’t look accurate enough. That model also sports a completely scratch built cockpit resembling the full size studio mock-up — very different to what they used in the models. I then look for locations to shoot them in. But to keep it fun and relaxed, I shoot when I happen to come across something interesting — I don’t go around looking for it. 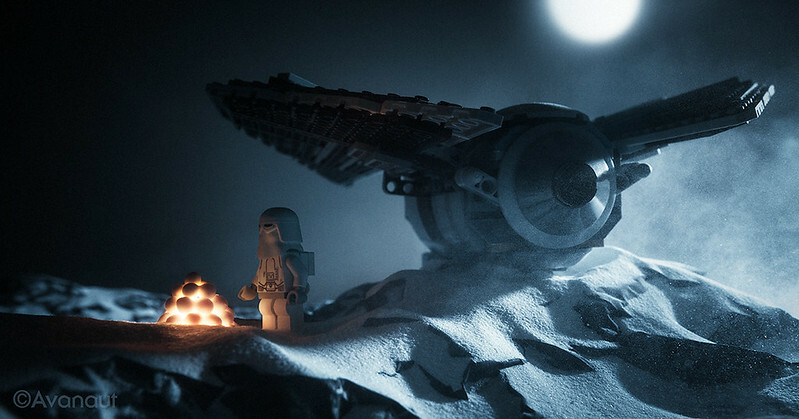 I don’t take the models to locations and shoot them as foreground miniatures. I shoot the models separately afterwards, matching the angles and lighting the best I can. The models wouldn’t survive all the handling necessary to move them around, they’re very fragile. After this, it’s just heavy photo-shopping to marry the two elements. 3. Which photo was the most difficult or interesting for you to create? So far the most difficult ones are the ones with tree branches and all sorts of twigs in front of the model. The masking is a nightmare. Personally, I love the ones with mists and fogs, summer and winter. 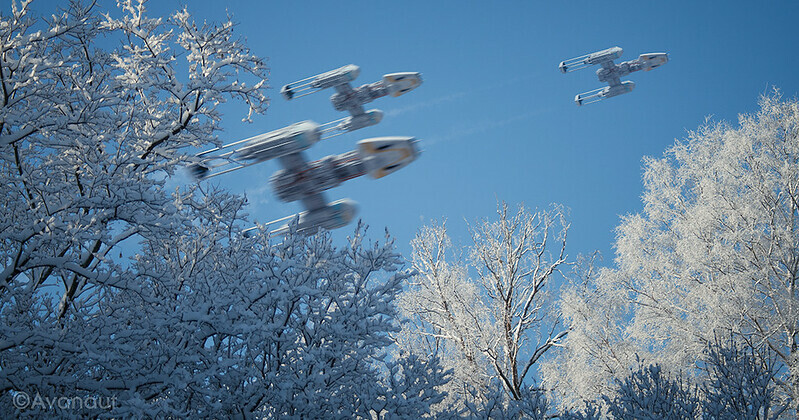 The one I have the fondest memories of is probably “My Winter Wonderland.” It’s one of the earliest shots with the newly finished big X-wing model and the realism of it blew me away. I was very happy with how the model performed in camera. The angles aren’t perfect, focal lengths are a mismatch, but I love the overall atmosphere. 4- The Finnish landscape is a perfect fit for your photos. Do you have a favorite spot here in Finland to shoot photos? I’ve only recently found Lapland and I would love to go there again to get more accustomed to the landscape. Last year was my first trip with the camera and I was so overwhelmed I got almost nothing done. Most of my outdoor photography has been shot within a few hundred meters from my home on Helsinki. I take out our dog and I keep my camera with me. If something looks good, I shoot a few frames and see afterwards if they are any good. I try to capture the outdoor ambiance in a moment when it looks a little more exciting than usual, or at least a little bit different to what I mostly see online. There are amazing outdoor photographers out there, they travel a lot and go to places I wouldn’t know how to travel to and spend more time on their work than I could invest. But like them, I try to find my own niche, and so far the backyard has proven to be quite a versatile location. 5. What are you working on now? Any upcoming projects? I’m working on the basement of our home. We just had the dreaded plumbing overhaul and everything in our home is in cardboard boxes still. The basement is the last stretch, and it’s almost done. I plan to allocate more time to this after the repairs are done and perhaps try to find new angles to do it. A couple of new models are on the workbench (or will be once I unearth them from storage) and I can’t wait to present them with new photographs. I can’t disclose anything further about new projects, really. If I did, then I’d feel obligated to follow them even if they didn’t work after all. This way I’m more free to fail. And I like to fail. Without it, there’s no discovery. Which one is your favorite? Let us know in the comments below, and be sure to check out the rest of Vesa’s amazing photos on Flickr. 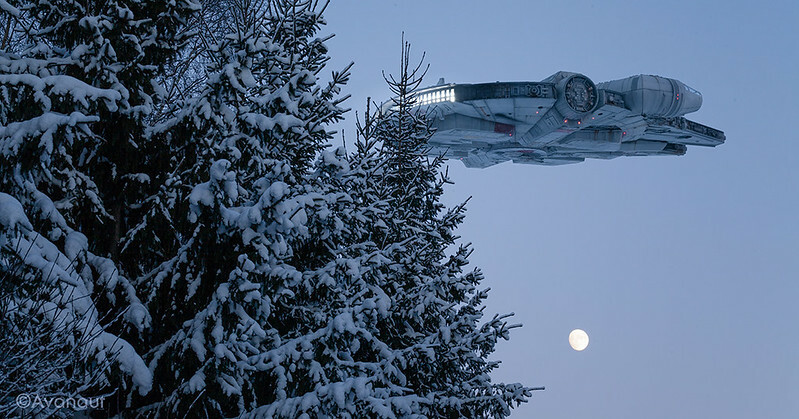 Who need the ice planet Hoth when you have Finnish winter!!!! 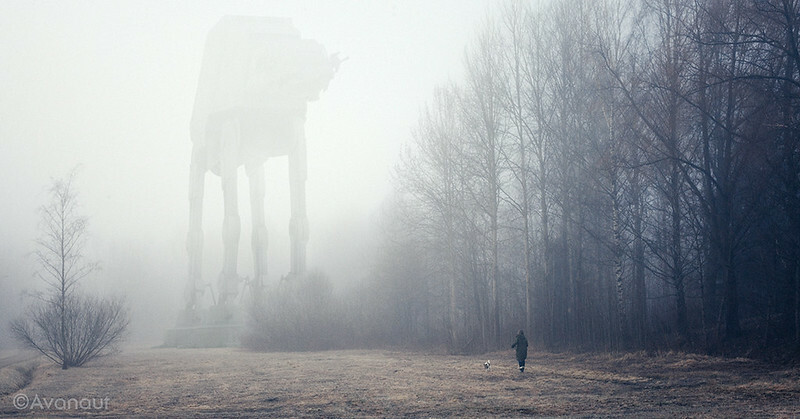 The Ice Planet Hoth will be rather bland to you guys.